The common ancestor of the cat is found in the Middle East and North Africa – the African Wild Cat – where cats were first domesticated.The ancient Egyptians worshiped cats and they were deified as the goddess Bast or Pasht. The word puss is believed to come from Pasht. Cats were even mummified and placed in tombs. During the Middle Ages, people were obsessed with the devil and believed he took animal forms. Because cats were night creatures and often owned by women accused of being witches, many cats were burned at the stake with their owners. These superstitious people paid the price of murdering cats during the period known as the Dark Ages. The rat population increased because there were no cats to control their growth. The Bubonic Plague or Black Death was caused by rat droppings in the food supply and killed millions of people. Fortunately, although it took a few hundred years, people came to their senses and recognized cats for the beauty, companionship and joy they bring to the home. 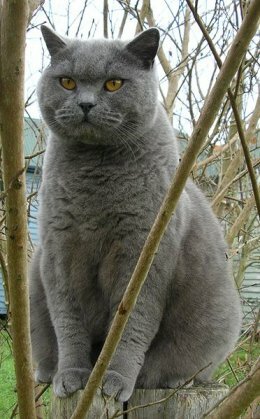 This month’s cat of the month is the British Shorthair. A mixture of cats brought to England by the Romans and native English cats. This breed is calm and does well in apartments. Why did my 11 month cat just die so mysteriously?